One, square glass votive candle holder that is 4" tall and approximately 2 1/2" wide. Disposable mixing container, mixing utensil, and newspaper. Any hand held woody stem pruning tool. Very small pebble rocks or gray aquarium rocks. Miscellaneous miniatures, such as mini trees or shrubs, mini pumpkins and/or wagon wheel etc..
Make a line around the milk carton 3 1/2" up from the bottom. Cut along the line around the milk carton. Attach each piece of dinner candle to the votive holder with clear contact glue on the markings. Apply some clear contact glue to the other side of the dinner candle pieces. Carefully lower the votive holder into the milk carton. When it has rested on the bottom of the milk carton, push the votive holder side, with the dinner candle pieces, against the milk carton to attach. Gently tap the milk carton against the table to remove any air pockets. Let the perma-stone dry for approx. one hour. Tear the milk carton off of your newly casted votive holder. With a small knife or pocket knife, carve out the two dinner candle pieces all the way to the glass votive holder. Wipe and scratch off any plaster that stuck to the portion of the glass votive holder that remains exposed. Let the newly cast votive holder set overnight. Cut some pieces of wax paper to fit over the window openings and glue them into place. Glue the other pieces of wood for the chimney, against the perma-stone, under the 1" cube to form the chimney base. Cut a front door from pieces of the 1/2" x 1 cm thin crafting wood. It should measure approx. 1 3/4" tall and 3/4" wide. Glue the front door into place between the windows. Let all the glue set. Using your glue gun and little pebble rocks/aquarium rocks, completely cover the surfaces of chimney wood pieces. Starting at the bottom of the back wall, lay the first log so that one edge is flush with a corner of the cabin, the other end of the log should extend 1/4" beyond the other corner. Work your way around the whole cabin this way until you come back to your starting point. For the next row you will need to lay the first log so that the edge is extending 1/4" beyond the starting corner of the cabin, and the other end is flush with the other corner. Continue to work you way around the whole cabin again. This will create the effect of logs criss-crossing together. Continue your way around the rest of the cabin, leaving openings for the windows and working around the chimney. Cut three pieces of doweling, each measuring approx. 3" long. Lay them along the top of the perma-stone ledge on all sides except the chimney side. Measure and cut two small pieces of doweling to fit between the chimney and the other doweling pieces. Glue those pieces down onto the perma-stone ledge on either side of the chimney block. Cut three pieces of the 1" wide, 1/8" thick crafting wood to the same dimensions as the doweling. Cut the 1/2" wide, 1 cm thin crafting wood into lots of 1/2" pieces. For the next row of shingles, lay the first shingle so that it is centered over one of the tiny cracks from the previous row. Continue around the roof until you reach the top of the roof. 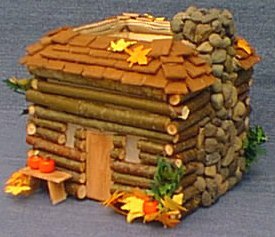 Glue on a few miniature items such as; Pumpkins (use small orange beads), Mini Trees or Bushes, Mini wagon wheel, or anything. Use your imagination. Insert a Tealight or Votive Candle and Enjoy!